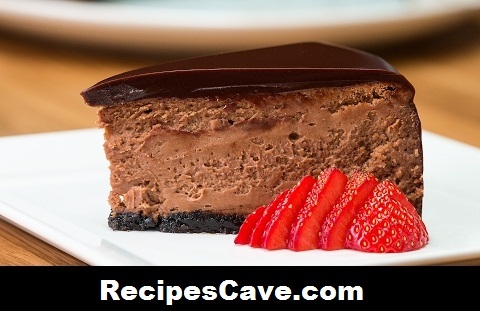 Chocolate Cheesecake Recipe - This chocolate recipe is for chocolate loving people who also want cheese together. Best chocolate recipe ever. Follow simple steps. Place cookies in plastic bag and crush them into a fine crumb using a rolling pin. Alternatively, a food processor can be used to crush the cookies. Pour the cookie crumbs into a medium bowl with the melted butter and brown sugar. Mix until the crumbs take on the character of a coarse, wet sand. Pour the crumbs into a 9-inch spring pan. Press the crumb firmly into the pan, making sure to coat the bottom evenly. Once the crust has been formed, place it in the refrigerator to firm up. Add cream cheese, melted chocolate, cocoa powder, and sugar to a large bowl and whisk, either by hand or with an electric mixer, until all the ingredients are incorporated. (NOTE: If mixing by hand, it is recommended to microwave the cream cheese before whisking in order to soften it up.) Add vanilla extract and eggs, and continue to whisk until mixture is smooth and glossy. In a separate bowl, combine heavy cream and powdered sugar. Whisk until the cream develops a mousse-y texture and soft peaks form. Adding a small amount at a time, carefully fold in the whipped cream into the cream cheese batter, being careful not to let the air out of the fluffy mixture. Fold just until incorporated. Once combined, pour the batter over the prepared cookie crust inside the springform pan. Use a spatula to smooth out the top. Give the pan a slight jiggle to release any large air bubbles that may be trapped in the batter. Place the filled pan on top of a sheet of aluminium foil and fold the foil up the sides on the outside of the pan. Then place the wrapped pan into a larger baking pan or dish lined with 2 paper towels at the bottom. The aluminium foil will keep water from seeping into the bottom of the pan and the paper towels ensure that the heat is distributed evenly along the bottom of the pan. Fill the larger pan with about 1 inch of hot water. Bake at 300˚F/150˚C for 60-70 minutes--checking every 15-20 minutes to add more hot water to the larger dish, as necessary. Once out of the oven, immediately run a small sharp knife around the outside of the cheesecake to release it from the pan. Allow the cheesecake to cool completely before removing it from the pan. Prepare the ganache by combining chocolate chips with hot cream. Stir until chocolate is completely melted and ganache is smooth and glossy. Pour ganache evenly over the cooled cheesecake. Refrigerate the ganache covered cake for 30 minutes before cutting and serving. your Chocolate Cheesecake Recipe is ready to taste.